This highly versatile and popular forced action mixer is capable of mixing up to 234kg of materials in just a couple of minutes, ensuring that you have the concrete, screed, resin bound gravel, mortar, plaster or epoxy exactly when you need it. Its purpose made arms and paddles are designed in such a way to help to eliminate any clumping of materials within the mix, unlike traditional Belle mixers, you won’t need to shove a tool in to break up any lumps or clumps. 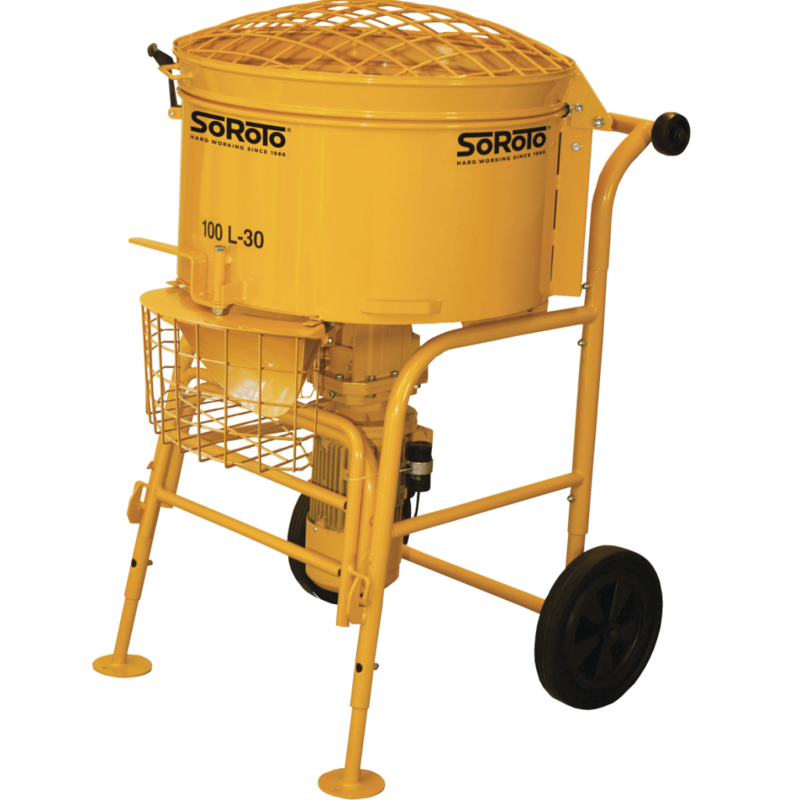 With a durable, quiet and efficient 1.1kW motor delivering power at a steady 30rpm, the SoRoTo forced action mixer can mix granular, stony and liquid-powder mixes with outstanding capability. 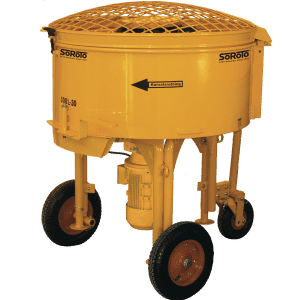 Both rubber and steel paddles are available, making this single forced action mixer your go-to machine for mixing so many different materials. No longer will you need to carry several machines to mix different products, the SoRoTo 100L can mix them all without effort. 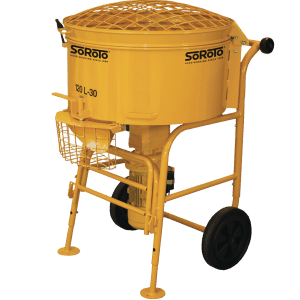 With a folding and removable bucket-holder for smaller mixes, particularly mixing plaster or render, and adjustable legs & wheels for use with wheelbarrows on larger projects, particularly when mixing resin bound gravel, concrete or screed, the SoRoTo 100L is capable enough to deal with jobs both big and small. Why use a forced action mixer? In the UK, it has almost always been the case that on-site mixing of cementitious materials has been done using either a mini-mixer or a site mixer, often known as gravity mixers or tumble mixers. The most common reason for using these is that it’s generally the industry standard, which set its standard before there was an awareness of forced action mixers and how they can be used for mixing these particular materials. In fact, many concrete flag and block manufacturers use forced action mixers to produce their products owing to their superior abilities to mix effectively and smoothly. While a mini mixer may have a total pan capacity of 135 litres, the actual mixing capacity of this is in fact much less at around 90 litres. The SoRoTo 100L forced action mixer in comparison has a total mixing capacity of 100L, meaning you can get more from each mix, therefore saving time, energy and money. With the SoRoTo 100L’s capability to be transported in the back of a van or pickup and easy-loading wheels, it can be moved around by a single person to wherever it might be needed, even through doorways and up stairs. 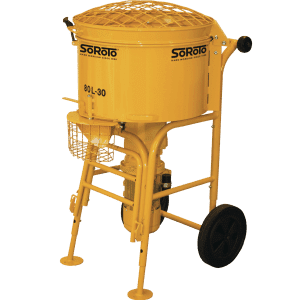 One of the most common purposes for the SoRoRo 100L is its use in the resin bound gravel sector, due to its ability to mix the industry standard ‘4-bag mix’ of around 100kg of kiln-dried aggregate along with a 6-7.5kg bucket of two-part polyurethane resin binder. As the machine is super-portable, you can take it through gates and it can fit even in small vans, making it a fantastic alternative to older, outdated mixers such as the diesel powered Creteangle forced action mixers.